Magnificent pyramids, the silent Sphinx, gigantic temples of stone, a land and people shrouded by the mists of time. 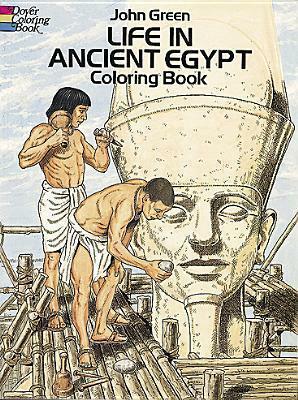 Here's a subject that promises to captivate coloring book enthusiasts and anyone intrigued by the life and customs of ancient Egypt. Forty-four authentically detailed drawings by artist John Green recall the glory of a magnificent civilization -- from the beginning of the dynasties (ca. 300 B.C. ), through the Old, Middle, and New Kingdoms (ca. 2700-2010 B.C. ), to the rule of the Ptolemies and the Roman conquest (30 B.C.) Included are expertly drawn and well-researched full-page illustrations of Cleopatra, Ramses II, the Pharaoh Akhenaten and his beautiful wife, Nefertiti, as well as scenes depicting many aspects of Egyptian life -- construction of the six-story step pyramid at Sakkara, fishing and farming along the Nile, the Sphinx and pyramids at Giza, goldsmiths and metalworkers creating elegant works of art, and more. Magnificent pyramids, the silent Sphinx, gigantic temples of stone, a land and people shrouded by the mists of time. Here's a subject that promises to captivate coloring book enthusiasts and anyone intrigued by the life and customs of ancient Egypt.Forty-four authentically detailed drawings by artist John Green recall the glory of a magnificent civilization -- from the beginning of the dynasties (ca. 300 B.C. ), through the Old, Middle, and New Kingdoms (ca. 2700-2010 B.C. ), to the rule of the Ptolemies and the Roman conquest (30 B.C. )Included are expertly drawn and well-researched full-page illustrations of Cleopatra, Ramses II, the Pharaoh Akhenaten and his beautiful wife, Nefertiti, as well as scenes depicting many aspects of Egyptian life -- construction of the six-story step pyramid at Sakkara, fishing and farming along the Nile, the Sphinx and pyramids at Giza, goldsmiths and metalworkers creating elegant works of art, and more.An informative introduction and fact-filled captions accompany this fascinating chronicle of life in the Land of the Pharaohs. Stanley Appelbaum served for decades as Dover's Editor in Chief until his retirement in 1996. He continues to work as a selector, compiler, editor, and translator of literature in a remarkable range of languages that includes Spanish, Italian, French, German, and Russian.